No matter what task you're undertaking, Thompson's® WaterSeal® products make it easier. Here is an easy deck care and maintenance check list for cleaning, protecting, and applying product. 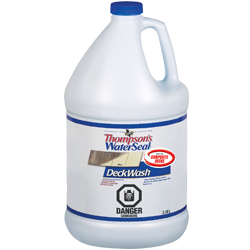 You'll find the right Thompson's® WaterSeal® products to meet your specific needs. 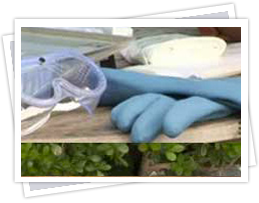 Protect your body from any splashes which may occur while working with cleaners and waterproofers. A long sleeved shirt, long pants and closed toe shoes work for clothing. Then add rubber gloves, safety goggles, maybe an old hat, and you'll be in business. Anything nearby you want to protect, like plants or other surfaces, should be sprayed with water and covered with plastic sheets or removed all together. As soon as you're done with the job you'll want to pull the plastic off and spray the plants down again to dilute and neutralize any of the cleaner they might have come in contact with. All exterior wood from decks to fences to siding should be cleaned before sealing, staining or painting. This is a crucial step as it will extend the life of a waterproofer or stain. Even new wood can have dirt or other invisible barriers to the penetration of a coating. For instance, new wood can have an invisible mill glaze, caused when the heat of the milling equipment reacts with the natural oils in the wood. Sometimes a weathered board can be flipped over and re-installed bottom-side up. Since the bottom side has not experienced the same wear and tear that the upside has, it is likely you will be able to get some more life out of the same board. Tools for cleaning need not be expensive or complicated. A plastic garden sprayer works for most types of cleaners, except strippers, which should not be sprayed on. Don't use a metal sprayer or container — most cleaners are corrosive to one degree or another, and will react with the metal! After waiting the recommended time, use a synthetic, stiff bristled brush to scrub the surface. Then use a garden hose or pressure washer to rinse away the residue. Here is a basic guide to follow when selecting a wood cleaning product. 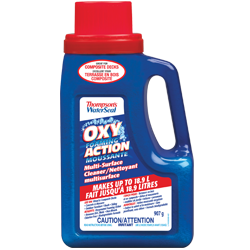 Stains from dirt, mildew, algae & fungus and there is little or no trace of a residual finish. Weathered clear & tinted waterproofers or semi-transparent stains in addition to stains from dirt, mildew, algae & fungus. On EXTERIOR SURFACES such as Wood & Composite Decks, Fences, Concrete & Masonry, Outdoor Furniture, Roofs & Siding: Stains from dirt, mildew, algae and fungus with a non-bleach, chlorine-free oxygenated foaming formula. After cleaning, your wood will need protection from water damage. It is important to wait 2-3 days, depending on weather conditions, for the wood to dry thoroughly before applying a Thompson's® WaterSeal® waterproofer or stain. 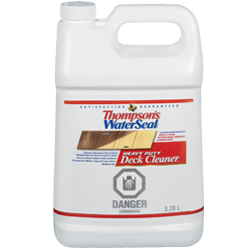 Products like Thompson's® WaterSeal® Advanced waterproofers may be applied after only a few hours, depending on the cleaner you choose. Existing wood should be tested to determine if it is time to re-treat by using water to perform the splash test. If the water is absorbed rapidly, darkening the wood, it's time to reapply a waterproofer. If water beads up or otherwise sits on top of the surface, then it does not need protection at this time. Note: If you choose an oil-based-finish, you'll want to use natural bristled brushes or roller covers. For water-based finishes, use synthetic brushes or rollers. Some water-based finishes recommend against using a roller, so a paint pad is the best alternative. It is vital that you read the directions on the product label thoroughly before applying any of these products to a surface. The efficiency of a pump-up sprayer greatly reduces the length of time it takes to complete your project. Pump-up sprayers can be used with most waterproofers, but they should not be used for stains. Depending on the job, brushes, rollers and exterior applicator pads can be ideal for easy product application. Brushes are particularly effective in tight or hard-to-reach spaces. Cleaning up typically requires mineral spirits if you use an oil-based waterproofer or stain, while soap and water are all that is required for water-based waterproofers and Latex Waterproofing Stains — but double check the label to be certain. Cleaning up well, drying, and carefully storing your tools ensures they're ready for use the next time you need to start a project.